Imbrium is a large mare with few craters. The largest are Archimedes, Autolycus, Aristillus and Cassini, all clustered along the eastern side, outside the inner ring of mare ridges where presumably the lavas are not so deep. A second concentration, this time of medium size craters, lies in the southern third of the mare. From east (right) to west they are Timocharis (diameter 33 km), Lambert (30 km), and Euler (27 km), with little Pythias (20 km) on a line from Lambert and Copernicus. All of these craters are Eratosthenian in geologic age. This means that they are relatively young (probably 1 - 2.5 billion years) but they have lost most of their rays. All are complex craters, with the smallest having scalloped rims and slumps along their floors and the largest have terraces. The ejecta from Timocharis and Lambert are clearly superposed on top of the mare, mostly. In both cases young flows cover small parts of their continuous ejecta. The nearby ejecta of the two small craters is largely covered by Imbrium lavas. 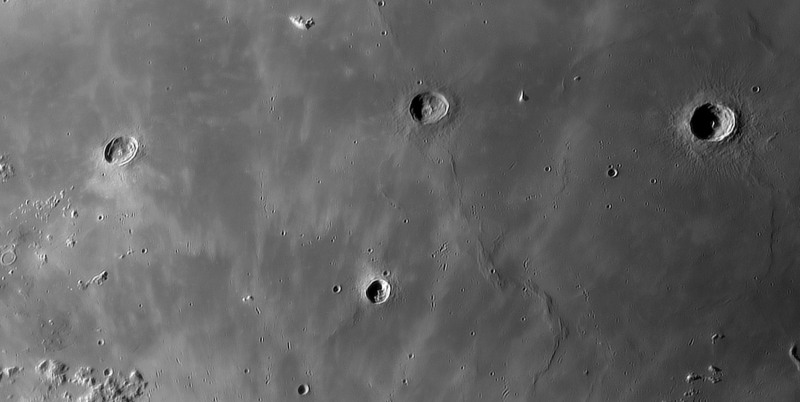 Younger than any of these four craters are the secondary craters and rays from Copernicus. 24 Aug 2008 around 3h50mUT. Newton Skywatcher 250mmEQ6 f: 23,5 + Videocamera Mintron 13v6-EX- + Canon MV500i + Red Filter W25 + Powermate 5x. VirtualDub and Avisynth for deinterlace and video capture. Dark and flats performed with iPrep. Registax5 + Avistack 1.74 + Photoshop + Focus Magic. Part of an 11 image mosaic with PTGui, 300/1500 images at 50 img/sec. This page was last modified on 18 August 2018, at 20:33.